We were told to be ready anytime between 6:30am and 7:30am to be picked up by Mekong Bus Company for our bus to Bangkok, Thailand from Siem Reap, Cambodia. Of course, they arrived at 7:30am. The Sarai Resort and Spa concierge had helped to book the bus for us. This allowed for us to pay with a credit card. The tickets cost $25 a person, which seemed to be about $5-$10 more than some of the other bus companies. Well…I guess you get what you pay for. We were picked up in a mini bus that had VIP written all over it. 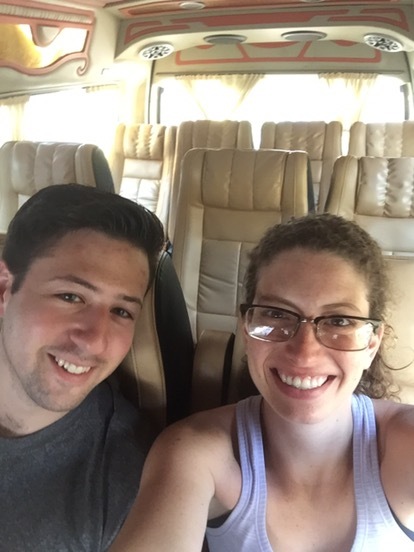 We drove into town to the Mekong Bus Company and quickly learned that we were the only people traveling to Bangkok, Thailand that day. We had the WHOLE bus to ourselves! Even if the bus was packed full of people, we still would have been very comfortable. The seats were comparable to what you would find on a business class flight. They reclined all the way back so you could lay completely flat, but only if there is no one sitting behind you. Since we had the place to ourselves, that’s what we did. We slept pretty much the whole way from Siem Reap to the Thai border. When we reached the border the driver asked for our passports and told us to wait in the car. We were slightly confused, but just relaxed until he returned. About 20 minutes later, he returned without our passports and began to drive us closer to the border. At this point we were even more confused. When he stopped, another man from Mekong Bus Company opened the door and told us to follow him. He had our passports with him and walked us straight to the express line, which wasn’t even a line. We showed our passports, they were stamped, and that was it; we were in Thailand. We walked out and were told to wait for the bus, which pulled up shortly after. We were shocked. After reading about the horror stories of spending 2-4 hours at the border we had prepared for a miserable experience. We were gladly mistaken! The driver took us to the main office on the Thailand side and one of the owners then told us he was waiting for paperwork for the vehicle and we may have to wait about 30 minutes. We explained to him of the stories we had heard and told him 30 minutes was not a problem. We decided to walk around, look for a SIM card and grab a bite to eat. All of the SIM card companies completely overcharge at the border, so definitely wait to get a SIM card if you can. We gave in and tried the Thai KFC. We first said we definitely shouldn’t do it, but there really weren’t any other better options. Turns out the spicy KFC chicken was really good. Definitely not something you can get in America! I know for sure my dad would LOVE it. It’s extremely spicy, so if you don’t like spicy or only like a little bit, this is not for you. After nearly 30 minutes and some attempt to cool my mouth down, the owner told us we were ready to go. Steven and I got into the bus and then found that two new employees of the company, who had just arrived, were joining us. We are convinced that there was no paperwork issue and that they made us wait so that these two employees could hitch a ride to Bangkok with us. One of them was a male who sat in the back and slept most of the time. He was definitely helpful as he spoke a lot more English than the driver and could help us figure out how to get to our hotel once we arrived in Bangkok. The other person was a female who seemed to be in a relationship with the driver. The situation got weird, fast. She began massaging him and hand feeding him a variety of fruit throughout the whole trip. She also had this minty serum that she kept rubbing on his body. This went on for a few hours. When we arrived near Bangkok airport, traffic was a disaster. We probably would have been better off asking them to drop us at the airport and taking the public transportation system (air train, BTS, or subway) to get to the hotel, for more reasons than saving time. Unfortunately, we didn’t know better at this point, so we were stuck in the car for a good hour and a half with the love birds until they dropped us at a BTS station. We went up to the platform and got our tickets to Sarasuk station, right next to the Eastin Grand Hotel Sathorn. This hotel is actually connected to the BTS via a foot bridge, which was very convenient. 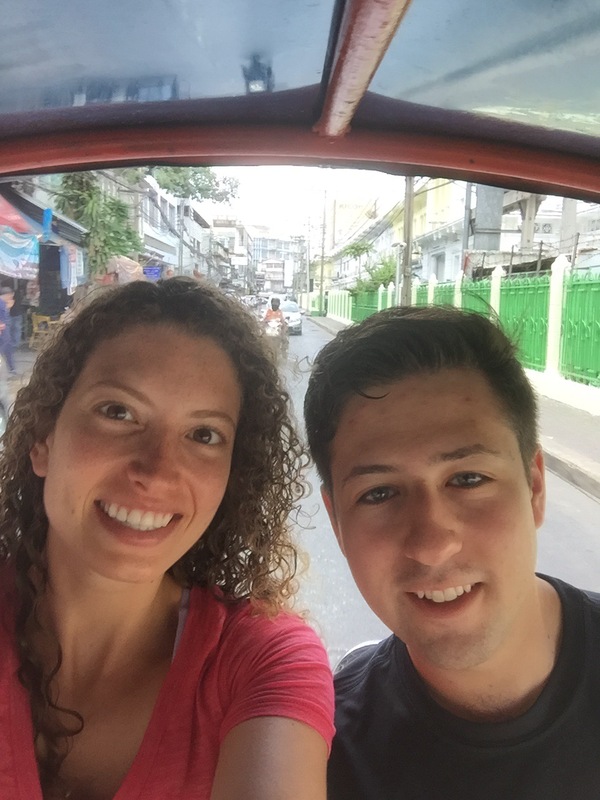 We thought we would have used the air train and public transportation a lot more than we did in Bangkok. Being that Uber is available in Bangkok, we opted for this due to no difference in cost. 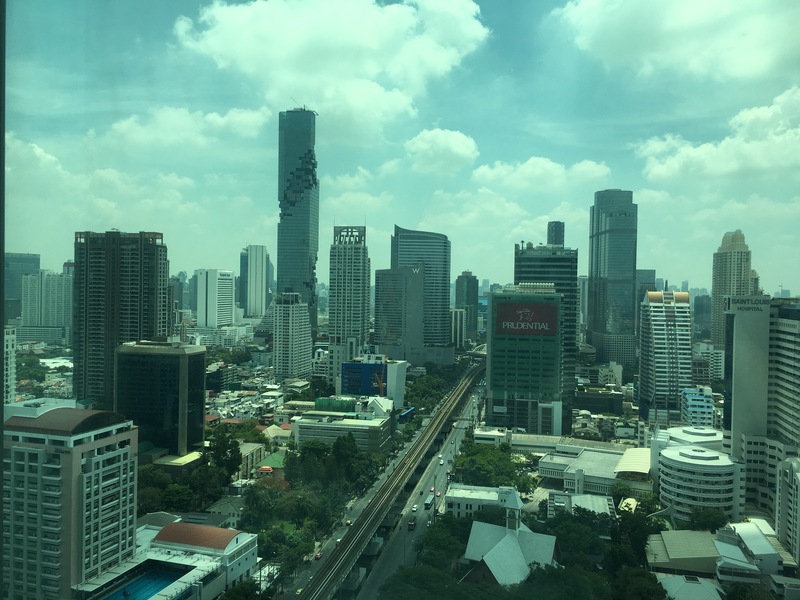 The Eastin Grand Hotel Sathorn is very upscale, but to our surprise, we were not the only backpackers there. They usually have good and fair rates on agoda, so definitely check it out on there before you book. We had a room on a high floor and an incredible view of some of the city. We have been told that the rooftop bar of the Banyan Tree Hotel is the best view in the city, so try to make it there in the evening (they open around 5:00pm). Since the bus ride took a lot longer than expected, about 10.5 hours rather than 6.5, it was kind of late and we were ready for food and a fun night out. 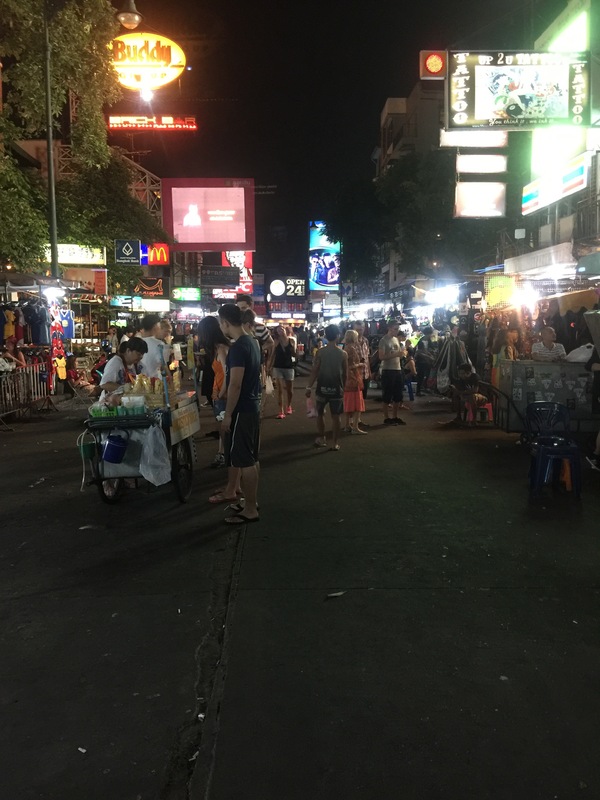 We headed to Koh San Road to meet Gillian and Gavin for dinner and drinks. We were finally in Thailand and I couldn’t wait for some awesome pad Thai, obviously. Along Koh San Road there are a multitude of street food carts as well as vendors selling clothes and gadgets. The street is closed down to cars, but some motorbikes come through here and there. It is lined with bars and each one is fighting with loud music against the next. We walked around and got some dinner. The carts with grills and skewers are great! We had some pork, beef with veggies, mushrooms, and chicken. Each skewer is 10 baht…$0.28! We then moved on to Pad Thai, which is basically made at every other food cart. We tried to figure out which one was the best based on the lines. I’m not sure that this was the right way to determine which cart to go to. To be honest, I was totally disappointed with the pad Thai on the street. It didn’t have much depth of flavor and was loaded too much with the veggies to the point that the noodle ratio was really lacking. 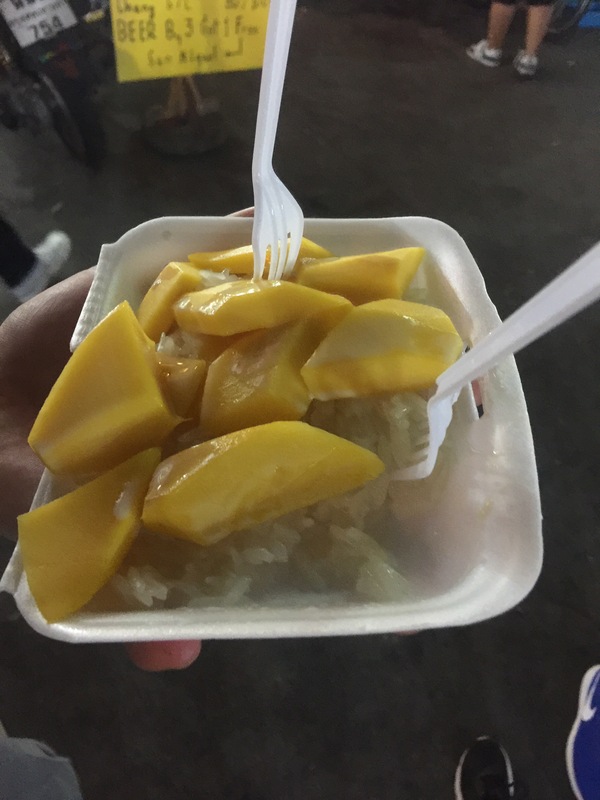 At this point we had eaten enough that I couldn’t be bothered trying to find a better food cart to get pad Thai from, so we went for some mango and sticky rice. Omg I could eat this all day everyday. Sticky rise topped with some coconut sauce and incredibly ripe mango–this is an absolute must!! Once we were stuffed, we found an awesomely chill bar called Roof Bar to kick back a few drinks. It is located on the third floor in the middle of Koh San road and is completely open air with fans and water misters everywhere. The walls are lined with photos of the Beatles, Marilyn Monroe, old records and funky art. We stayed to hear two bands play. First, a solo guitarist and second a duo of electric guitar and the seat drum. Both were really great and played cover songs of The Backstreet Boys, Beatles, FUN, and some pop artists. The drinks were reasonably priced, especially for a big city. A beer was around $3 and a tequila soda lime was $7. We had a really fun and kind of late night, so we slept in a bit the next day. When we got up, we went straight to the train station to get our tickets for the overnight trains in our future. You definitely should buy your tickets as early as possible! The first class seats sell out fast and those are definitely optimal, being that they are not that much more expensive. Next stop was the MBK shopping mall. This place makes the Palisade’s Mall in NJ look like an ant farm. I’m not even sure that we got to every floor, even after spending a good two and a half hours here. There are many boutique stores, vendors selling clothing and knockoff bags and shoes, electronics sellers and eyeglass stores. There are also a few tailors and a section devoted to food. 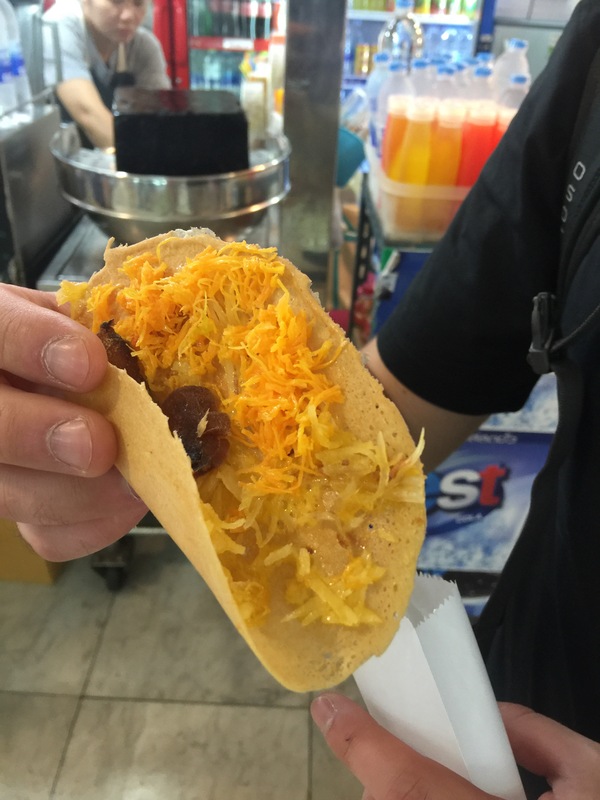 We had a sweet snack of a pancake filled with coconut and dried fruit, which was really good. 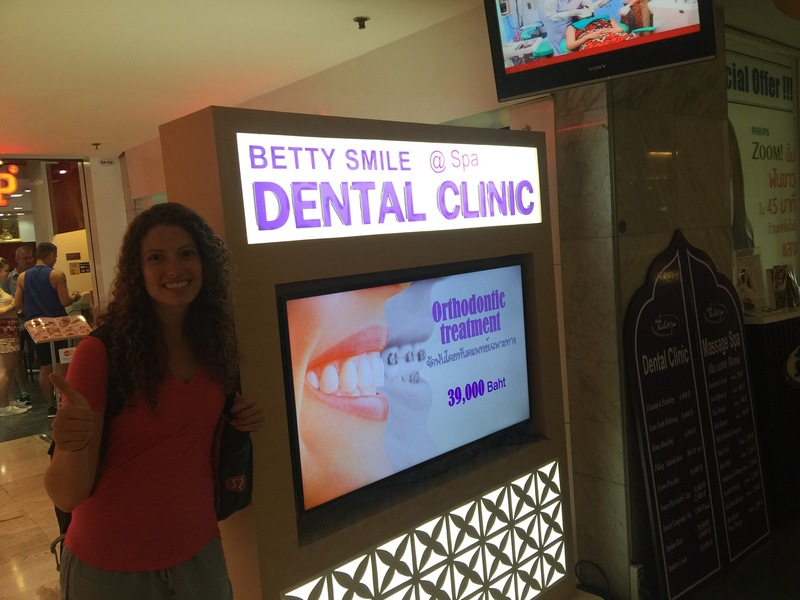 Jess also found a dental clinic here! We didn’t eat here as we were planning to go for an early dinner at Thip Samai, as per many recommendations from friends. We finished up and went to the hotel to grab our bags and make it to Thip Samai by 5:00pm, when they open for dinner.